In some cases, sections of a roof or wall will need to be removed to properly investigate certain conditions. This allows us to evaluate the extent of the problem and determine what materials should be used for repairs. Because of our familiarity with these materials, we can conduct the inspection by removing a smaller section that most contractors, which saves you money. 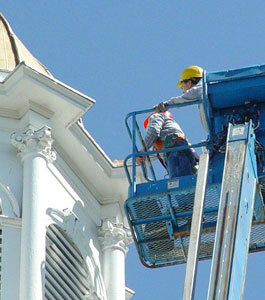 We understand that it can be costly to repair and restore older religious buildings and places of worship. That’s why we do more than give you an estimate after we’ve assessed and evaluated the condition of your property. We break down the costs and create a schedule of repairs. Our projects may last anywhere from one week to 10 years, and we’re happy to repair your property in phases if necessary. Phased repairs and restoration make it easier to meet budget requirements. Smart planning eliminates overlapping and duplicate costs, saving you money. One contractor handles all phases, resulting in a built-in, warranty, the highest level of quality control and seamless continuit throughout the project.